Monday to Sunday 09:00-12:30 / 16:00-19:00. The Bianca Modenese is a long-living, docile and fertile breed. – White coat (bulls may show grey shading on the neck and shoulders. – The Bianca’s most distinctive characteristics is a pink-coloured reversed V in the centre of the dark-grey wide muzzle. 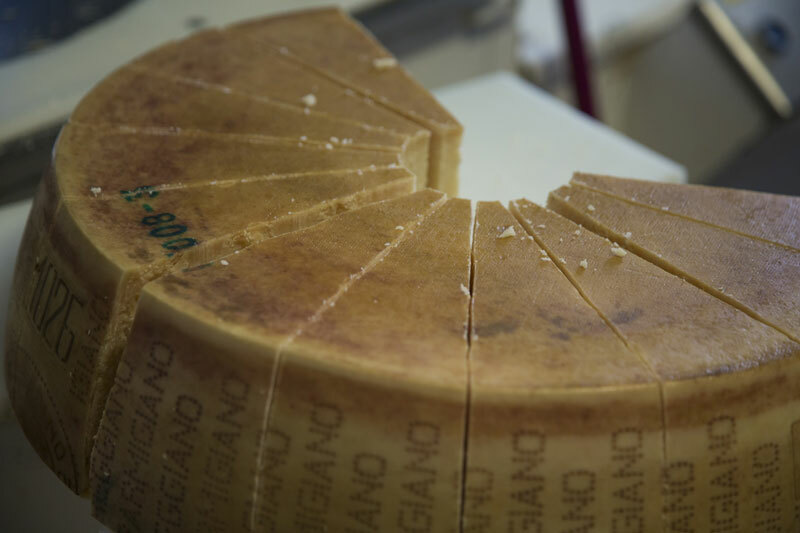 The breed is first documented in the mid-nineteenth century: its breeding – along with the breeding of the Reggiana Rossa (Reggiana red cow) – has always been tightly bound to the production of Parmigiano Reggiano. Over the course of the 19th century, the range and numbers of Modenese white cows expanded rapidly in the provinces of Modena, Reggio Emilia, Bologna and Mantua. In the 1950s, the population was estimated at 230,000. Then began the demographic decline that still continues today, with the Bianca being progressively replaced by others, more productive imported breeds. Today, only a few hundred examples remain. Bianca’s milk is particularly suitable for cheesemaking. Not only: the excellent ratio between fats and proteins and the high concentration of K-casein (B) make it easily processable. We are at the forefront in recovering, conserving and promoting this ancient breed. Indeed, to let it go extinct would be tantamount not only to losing a very important element of our culture and history, but also to renouncing to a raw material of indisputable quality. In 2000 the Province of Modena – along with Slow Food and Associazione Provinciale Allevatori (Association for cattle breeding and genetic improvement) – began to promote a biodiversity project for the recovery and promotion of the Bianca Modenese breed. 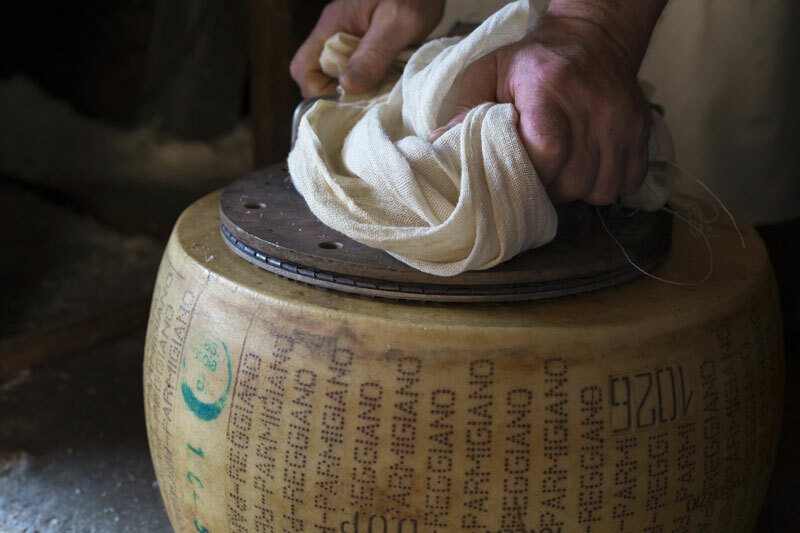 On 4 April 2005 farmers obtained the first wheel of Parmigiano Reggiano made entirely from Bianca’s milk. The wheel passed all quality checks with excellent results. 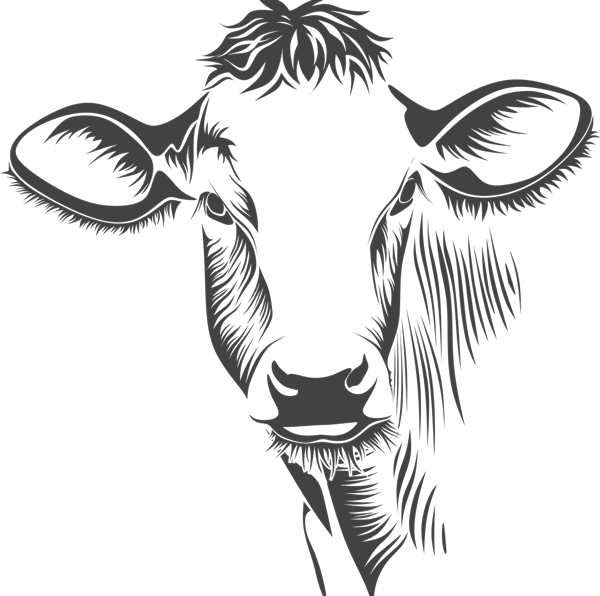 In 2006, the Slow Food Presidium began safeguarding the breed – ad not just a product in particular. Promotion of research activities and of assitance and supervision for consortium partners. The main aim of the Consortium is to start a distribution chain to guarantee high quality and honest prices to both producers and consumers. Cows must be fed with natural, GMO-free products. Silage, fooder and food whose preservation requires PH variation are not allowed. “Unifeed” feeding technique is not allowed. Integrations with minerals and vitamins are allowed under veterinary prescription. 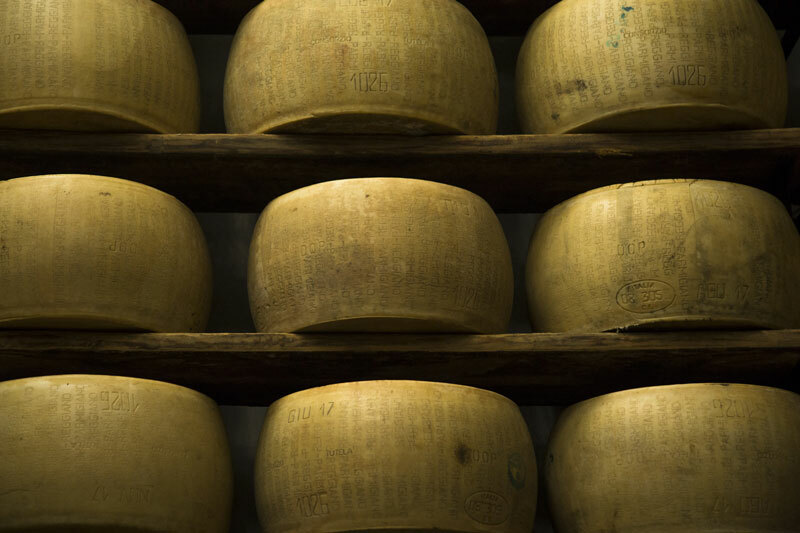 Parmigiano Reggiano is also known as “The King of Cheeses” thanks to its unique taste, high digestibility and richness in protein, vitamins and minerals. It comes therefore as no surprise that it is one of the most appreciated foods of Italian cuisine. 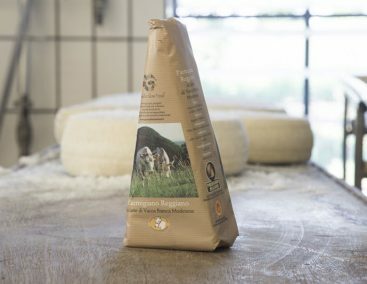 The high quality of our milk depends primarily on our fodder: the flower essences typical of the Apennines give the raw material – and the final product therefore – intense and persistent aromas. The milk produced by the Bianca Modenese – Slow Food Presidium is a raw material of exceptional quality thanks to its easily processability, the excellent ratio between fats and proteins and the high concentration of K-casein (B). Furmai is also known as “The Farmers’ Cheese”: it takes this name from the traditional custom of suspending the production activity on the day of Saint Catherine (25 November) and then resuming it the following spring. During that period, the milk that was left over from the breeding of calves was made into butter and Furmai directly in the farmers’ houses. 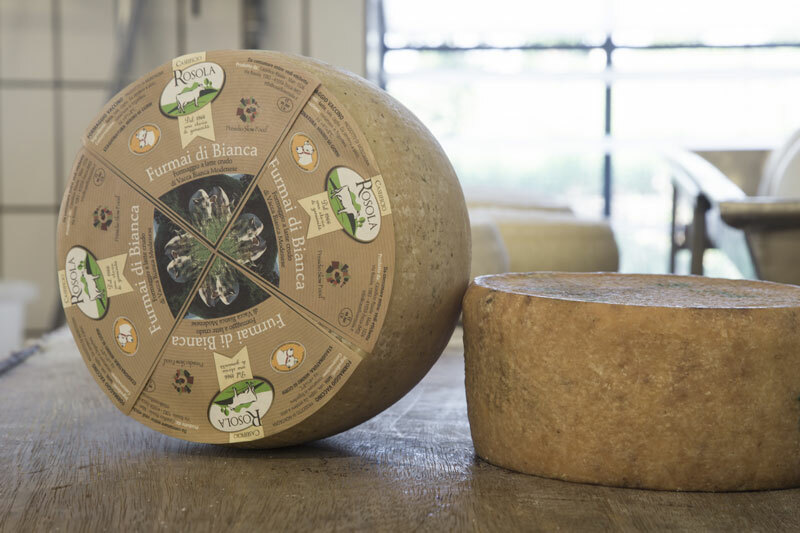 Each wheel weighs about 3Kg and contains simple ingredients: raw milk, salt and rennet. Furmai is a soft cheese with a fresh and persistent taste. Maggengo is a refined cheese – whose colour ranges from bright straw-yellow to golden – produced by cows fed with green fodder only. Ricotta is produced through coagulation of the proteins contained in the whey, the liquid that separates from the curd during cheesemaking. Ricotta represents the perfect synthesis of first-class raw materials and the mastery of cheesemakers. Its name means “cooked twice”. 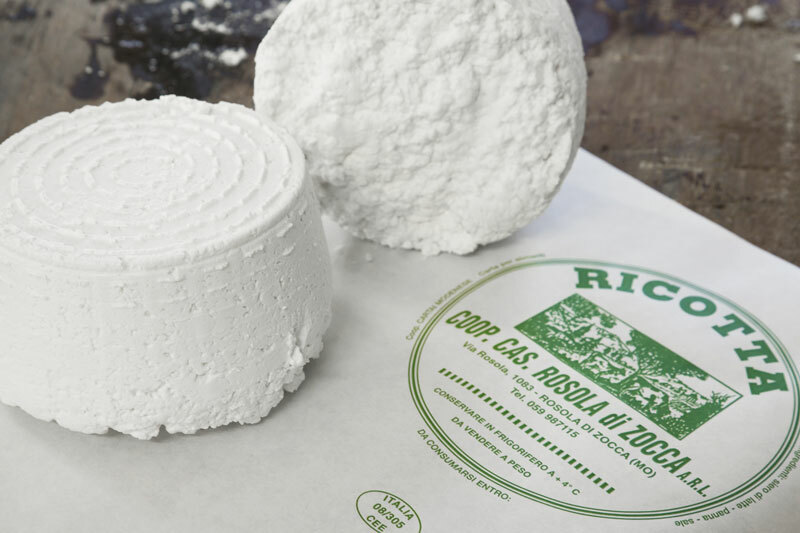 Indeed, ricotta is cooked a first time during the milk heating process, and a second time during the whey heating process. Once the coagulation temperature is reached, whey proteins aggregate into curds, retaining fats contained in the blend. 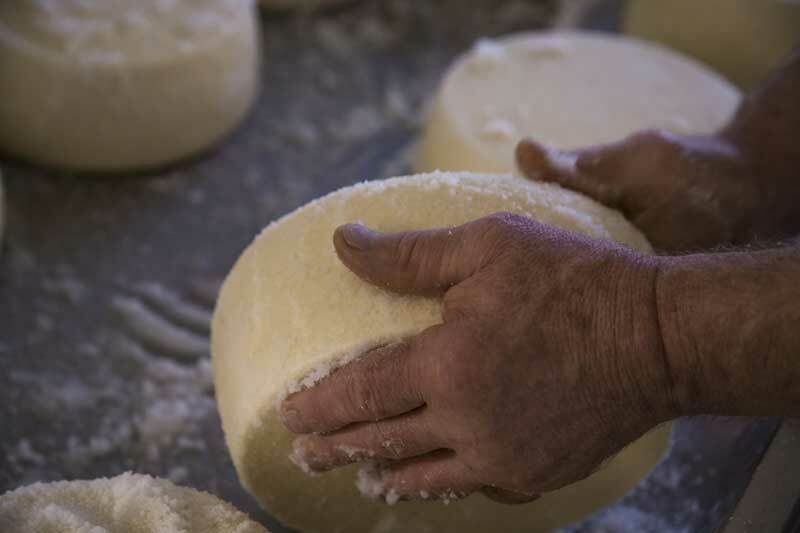 The curds are then ladled by hand into draining forms. 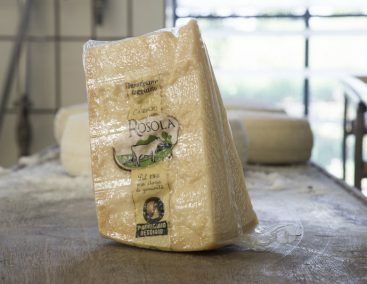 Caseificio Rosola produces a wide range of fresh and aged cheeses, along with several dairy products. All in observance of the traditional methods – rigorously without additives or preservatives. 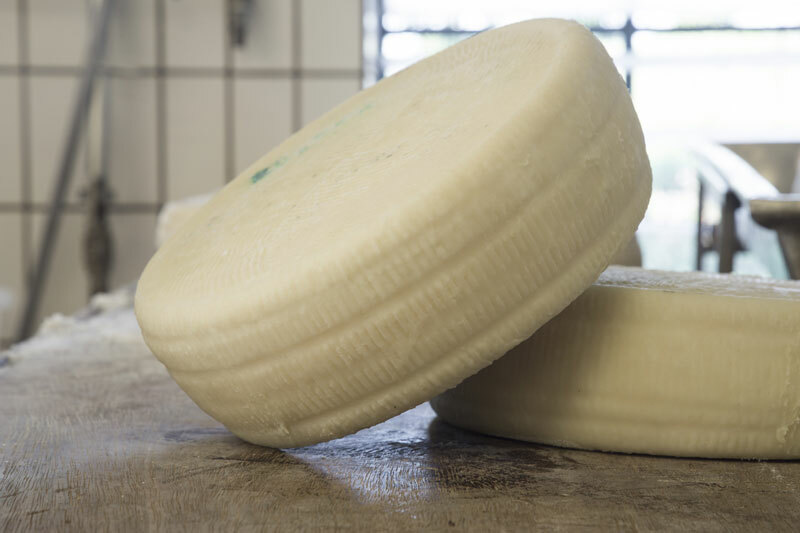 Caciotta deserves a particular mention: it is made for fresh consumption from a skilful blend of whole milk from the morning with skimmed milk from the previous evening’s milking. Goat cheese has high nutritional and organoleptic properties. Its high digestibility makes it particularly indicated for low-cholesterol diets. Caseificio Rosola (Società Agricola Cooperativa) was founded in 1966 by a group of farmers residing in the homonymous village located in the municipality of Zocca, in the province of Modena. 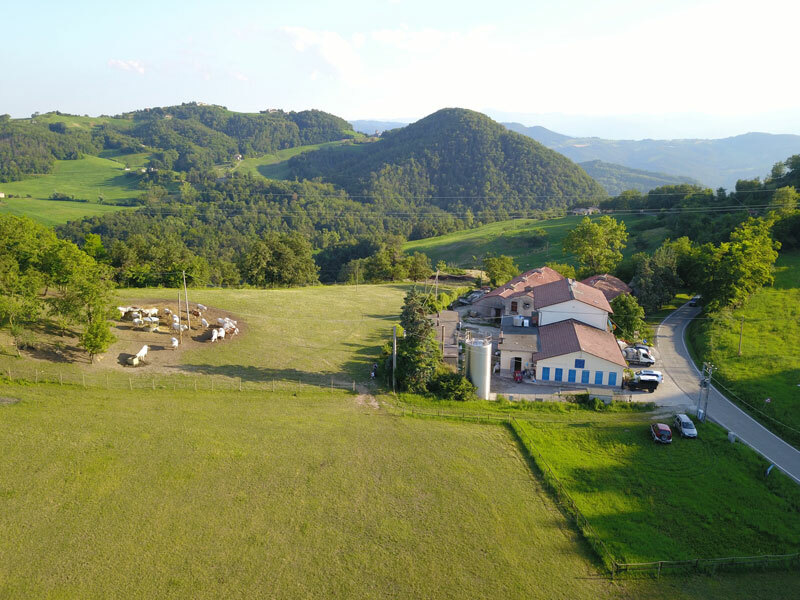 The founder members own several acres of farming and pasture lands located near the Caseificio. To fodder with which cows are fed is obtained from these lands. A few years ago, we decided to stop selling milk to other dairies to start processing it on farm. This allowed us not only to start selling our own products, but also to strengthen the protection and promotion of our territory, animals and raw materials. We promote and protect our territory, animals and raw materials. Caseificio Rosola has best know how to value its origins made of care and patience by keeping a close eyes on the evolution of the market. The Caseificio is now made up of eight members, who continue to pursue the same goals as their fathers and grandfathers. The ability to combine craftsmanship with new lifestyles and new customer needs characterises our business and our daily commitment to guarantee unique products with an unmistakable taste. It is precisely for this reason that in 2005 we introduced the Bianca Modenese breed. Our aim for the future is to increase our production capacity while continuing to manage independently all stages of the production and distribution chain. Introduction of the Bianca Modenese breed. The Bianca Modenese is now a Slow Food Presidium. 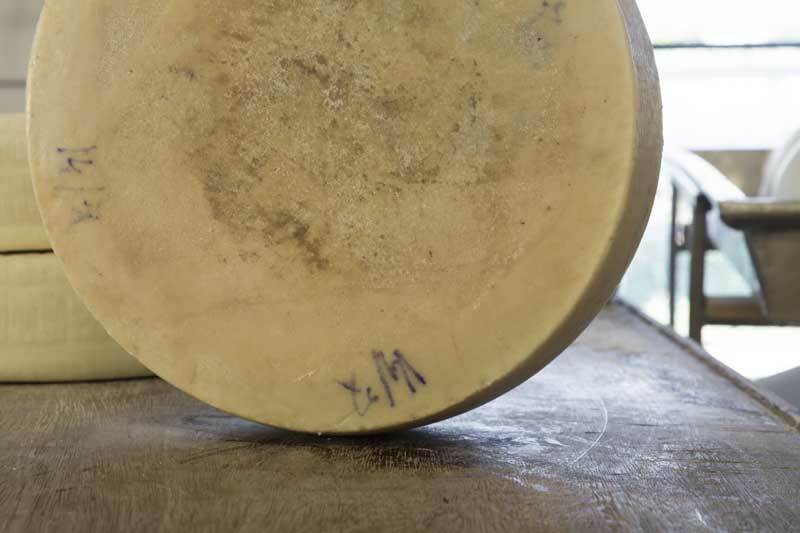 Identification numer of Caseificio Rosola, assigned by the Parmigiano Reggiano Consortium. The Caseificio is now made up of eight members, who continue to pursue the same goals as their fathers and grandfathers. We promote our origins, local traditions and community. The ability to combine craftsmanship with new lifestyles and new customer needs characterises our business and our daily commitment to guarantee unique products with an unmistakable taste. Caseificio Rosola Società Agricola Cooperativa has been recognized as beneficiary of a contribution by FEASR (European Agricultural Fund for Rural Development) regarding a project – approved under the PSR Emilia-Romagna 2014-2020 (Rural Development Program), Typology of intervention 4.2, Public Notice D.G.R. 227/2017, application n. 5050838 – included in the Progetto di Filiera 67 of the Consortium Terre di Montagna (Dairy Sector) entitled “Mountain Parmigiano Reggiano: the challenges of quality in climatic and market evolution”, proposed and led by the Consortium itself. 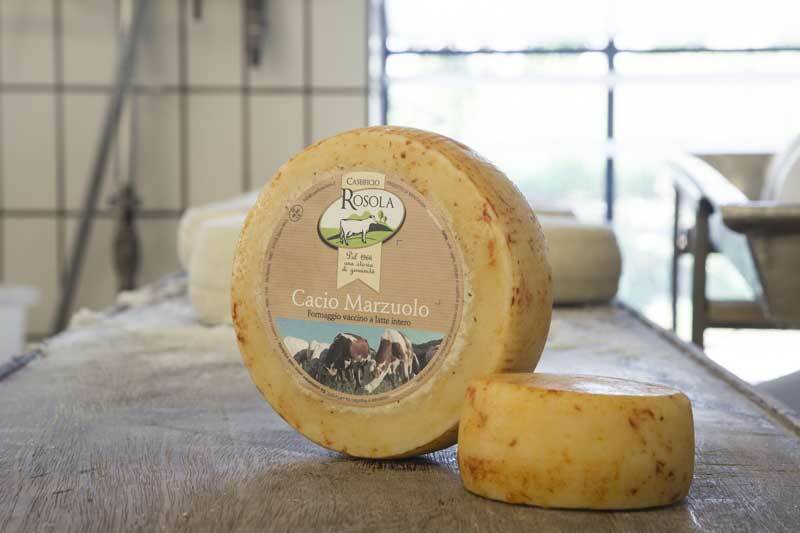 Caseificio Rosola produces a wide range of fresh and aged cheeses – rigorously without additives or preservatives. 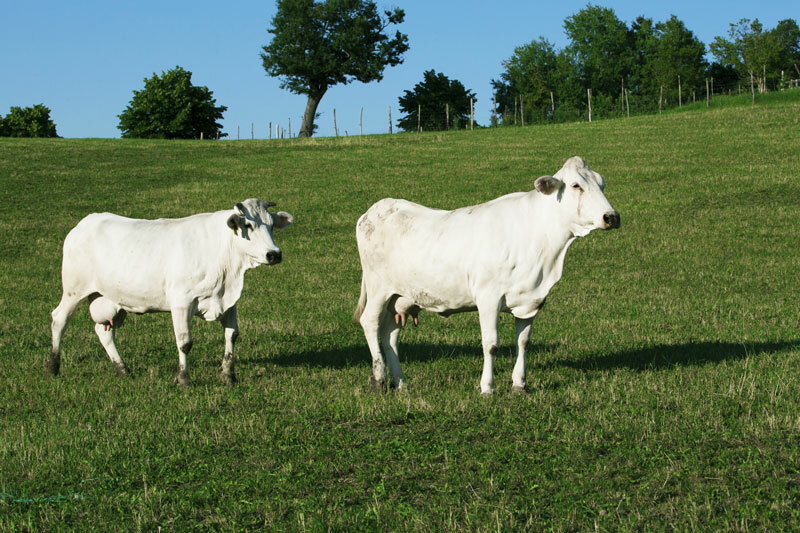 Caseificio Rosola is at the forefront in promoting the Emilian region and its biodiversity: since 2005 we are committed to recovering and conserving the Bianca Modenese breed (white Modenese cow). Indeed, to let this ancient breed go extinct would be tantamount not only to losing a very important element of our culture and history, but also to renouncing to a raw material of indisputable quality. In 2000 the Province of Modena – along with Slow Food and Associazione Provinciale Allevatori (Association for cattle breeding and genetic improvement) – began to promote a biodiversity project for the recovery and promotion of the Bianca Modenese breed. 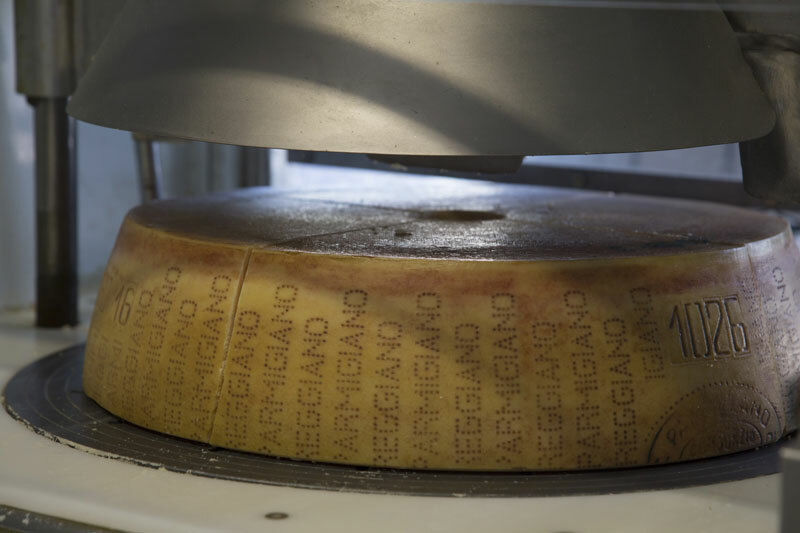 On 4 April 2005 farmers obtained the first wheel of Parmigiano Reggiano made entirely from Bianca’s milk. The wheel passed all quality checks with excellent results. 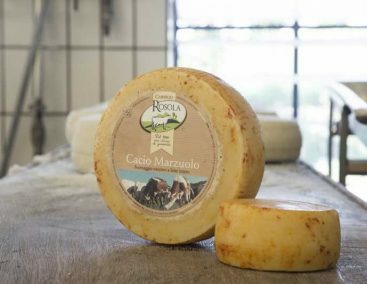 Il Caseificio Rosola commits itself to protecting and promoting the Emilian territory, animals and raw materials. This is how we guarantee high-quality products with a naturally typical, unmistakable flavour. We carefully treasure the precious teachings that our fathers and grandfathers handed down to us. This minor cattle breed of limited diffusion – native of the Po Valley – produces milk of unquestionable quality. The fodder of our production is enriched with the intense and persistent aromas of the Apennine Mountains. We aim to continue to manage independently all stages of the production and distribution chain. Da Lunedì a Domenica 09:00-12:30 / 16:00-19:00. Il valore aggiunto apportato dal latte del Caseificio Rosola è da rintracciare innanzitutto nei foraggi di nostra produzione: sono proprio le essenze vegetali e floreali caratteristiche dei prati dell’Appennino a conferire alla materia prima – quindi al prodotto finale – gli inconfondibili aromi intensi e persistenti. Il latte di Bianca Modenese – Presidio Slow Food è una materia prima di eccezionale qualità: l’ottimo rapporto fra tenore di grasso e indice proteico, e l’alta frequenza del gene B delle K-caseine, lo rendono più facile da lavorare durante il complesso procedimento che porta alla creazione del Parmigiano Reggiano. 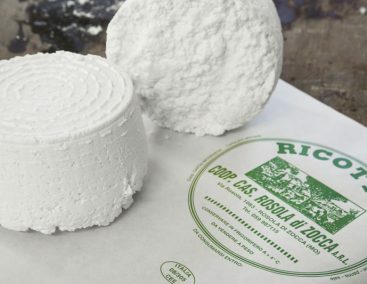 Pochi ingredienti – latte crudo, sale, caglio – vanno a costituire forme cilindriche da 3Kg ca: si tratta di un formaggio a pasta morbida, dal sapore fresco ma persistente. Sintesi perfetta fra eccellenza delle materie prime e maestria del casaro, la ricotta si ottiene grazie alla coagulazione delle proteine del siero – la parte liquida che si separa dalla cagliata durante la caseificazione. Mediamente più digeribile rispetto ai formaggi vaccini – e indicato nelle diete povere di colesterolo – con la sua introduzione ci siamo proposti innanzitutto di ampliare la nostra offerta casearia. Il Caseificio Rosola nasce nel 1966 come Società Agricola Cooperativa, per volontà degli allevatori residenti nell’omonima frazione del comune di Zocca (MO). I soci fondatori gestiscono realtà medio-piccole, dislocate nel raggio di pochi chilometri, dai cui terreni coltivati a prati-pascolo – con l’avvicendamento quinquennale di cereali – vengono ricavati i foraggi per l’alimentazione delle bovine. Smettere di vendere il latte a caseifici privati gestiti da ignoti, per iniziare a trattarlo in loco e ricavarne prodotti da commercializzare: un progetto che risponde all’esigenza di tutelare in prima persona territorio, animali e materie prime. Il Caseificio Rosola, nel tempo, ha saputo valorizzare le proprie origini – fatte di gesti specifici, cura e pazienza – seguendo da vicino le costanti evoluzioni del mercato: oggi siamo otto soci, e continuiamo a perseguire i medesimi obiettivi dei nostri padri e nonni. La necessità di coniugare la dimensione prettamente artigianale delle lavorazioni con nuovi stili di vita e richieste commerciali, ci ha portato ad assimilare il concetto stesso di tipicità: il nostro impegno quotidiano è volto infatti a garantire prodotti dal sapore inconfondibile, patrimonio di tutti. L’introduzione, nel 2005, della razza Bianca Modenese (il cui latte viene lavorato in filiera separata) risponde proprio a questo proposito. Senza dimenticare i preziosi insegnamenti che ci sono stati trasmessi, per il futuro ci proponiamo di incrementare la nostra capacità produttiva, continuando a gestire autonomamente l’intera filiera. 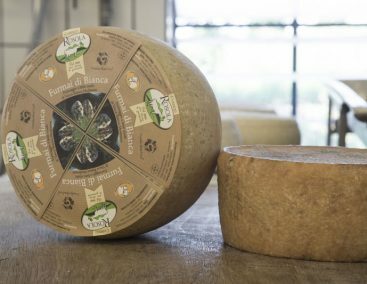 Le prime testimonianze relative alla Bianca Modenese risalgono alla prima metà del XIX secolo: l’allevamento di questa razza – insieme alla Rossa Reggiana – è da subito strettamente collegato alla produzione del Parmigiano Reggiano. Nel corso del Novecento, fra le province di Modena – Reggio Emilia – Mantova – Bologna il numero di capi aumenta costantemente: negli anni Cinquanta se ne contano ben 230.000. Poi, il declino: la Bianca viene infatti progressivamente sostituita da altre – più produttive – razze d’importazione. Oggi rimangono poche centinaia di esemplari. Risulta particolarmente adatto alla caseificazione. Non solo: l’ottimo rapporto fra tenore di grasso e indice proteico, e l’alta frequenza del gene B delle K-caseine, lo rendono più facile da lavorare durante il complesso procedimento che porta alla creazione del Parmigiano Reggiano. La Provincia di Modena – con la collaborazione del Movimento Slow Food e dell’Associazione Provinciale Allevatori – promuove un importante progetto di tutela per la biodiversità animale, che interessa da vicino la Bianca Modenese. Il 4 aprile 2005 abbiamo la prima forma di Parmigiano Reggiano ricavata interamente da latte di Bianca, e supera tutti i controlli qualitativi con risultati eccellenti. Nel 2006 il Movimento Slow Food sceglie di istituire uno dei suoi Presidi a tutela della razza – e non solo di un prodotto in particolare. Oggi siamo otto soci, e continuiamo a perseguire i medesimi obiettivi dei nostri padri e nonni. La necessità di coniugare la dimensione artigianale delle lavorazioni con nuovi stili di vita e richieste commerciali, ci ha portato ad assimilare il concetto stesso di tipicità: il nostro impegno quotidiano è volto a garantire prodotti dal sapore inconfondibile, patrimonio di tutti. Rosola di Zocca Società Agricola Cooperativa è beneficiaria di un contributo del FEASR per un progetto approvato a valere sul PSR Emilia-Romagna 2014-2020 – Tipo di operazione 4.2. – Approccio di sistema – Avviso Pubblico D.G.R. 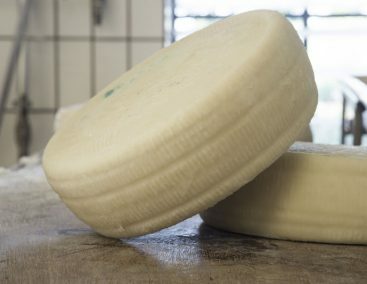 227/2017, domanda n. 5050838 compreso nel Progetto di Filiera 67 del Consorzio Terre di Montagna (SETTORE LATTIERO CASEARIO) dal titolo “Parmigiano Reggiano di Montagna: le sfide della qualità nell’evoluzione climatica e dei mercati” di cui la stesso Consorzio è proponente e capofila. 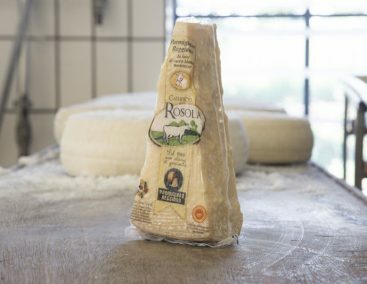 il Caseificio Rosola produce una vasta gamma di formaggi freschi e stagionati, senza alcuna aggiunta di additivi e conservanti. Il Caseificio Rosola è orgoglioso di essere in prima linea per quanto riguarda il recupero e la valorizzazione di questa razza: lasciare estinguere la Bianca equivarrebbe a perdere un elemento non trascurabile della nostra cultura, della nostra storia. E rinunciare per sempre a una materia prima di indiscutibile qualità. Negli anni Duemila, la Provincia di Modena – con la collaborazione del Movimento Slow Food e dell’Associazione Provinciale Allevatori – promuove un importante progetto di tutela per la biodiversità animale, che interessa da vicino la Bianca Modenese: il 4 aprile 2005 abbiamo la prima forma di Parmigiano Reggiano ricavata interamente da latte di Bianca, e supera tutti i controlli qualitativi con risultati eccellenti. l’unico modo per garantire prodotti dal sapore inconfondibile, naturalmente tipico. Abbiamo fatto tesoro dei preziosi insegnamenti che ci sono stati trasmessi. Alleviamo una razza autoctona, il cui latte è materia prima di indiscutibile qualità. Le essenze dei prati dell’Appennino conferiscono aromi intensi e persistenti. Per il futuro, ci proponiamo di continuare a gestire autonomamente l’intera filiera.